Indonesia is one of the economies the world has been eyeing on in the last few years. Also worth the mentioning is this world’s largest archipelago is seen as a country with remarkable resilience in the face of crisis. For instance, during the 2008-2009 crisis – which rocked the U.S., many European countries, and some Asia’s major economies, including China and India – the country managed to score presentable annual growth despite the slowdown in some sectors, with 2009 being the worst for the archipelago. 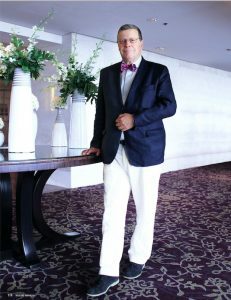 Indonesia’s favourable condition has attracted Jean-Pierre Diserens, who is an important figure in the realm of global economy, financial services and international policies because of his position as the secretary general and one of the founding members of Convention of Independent Financial Advisor (CIFA). Jean-Pierre is also known as the founder and chief executive of Fidurhorne S.A., an asset management and fiduciary trust company licensed by the Swiss Federal Banking Commission. He is considered as a true pioneer in the elite world of Swiss private banking as his firm is the first multi-family office in Geneva, established in 1976. “Multi family office didn’t exist back then. The increasing demand for people seeking a safe place to secure their wealth gradually led to the birth of multy family offices,” Jean-Pierre explains over a coffee chat with Registry Indonesia at a business lounge in a five-star hotel in Jakarta. As the name suggests, multi-family offices work exclusively with high net worth families to manage their assets and investments. And Geneva is very well known as the birthplace of wealth management, and the world’s capital of private wealth management. So, there are reasons why wealthy people consider Geneva as a safe haven to keep their money, diversify their assets; and no less important, to pass on their heritage. Jean-Pierre adds that some of the reasons why people chose Switzerland over other nations in terms of putting their wealth are, among others, the country is known for its tradition of privacy and discretion, the country’s political stability, and the Swiss Franc’s strong and stable currency. No less important is that Switzerland is listed as no. 1 among the top 10 tax haven places in the world. He often stresses the importance of CIFA, which, since its founding in 2001, has been at work on reinforcing independent financial advisors (IFAs) at the international level so as to able to represent the interests of investors. CIFA has members coming from 40 national IFAs from 24 countries with combined membership of around 300,000 financial advisors. In Indonesia, the CIFA partners with the Financial Planner Association Indonesia (FPAI) and Financial Planning Standards Board (FPSB). In his capacity as the co-founder of CIFA, among other things, Jean-Pierre has been working closely with some of UN agencies, notably the Economic and Social Council (ECOSOC). With Indonesia, he is connected to the Jakarta-based organization, the Swiss Village. The organisation aims at bridging Indonesia and the Swiss financial community and provides consultation, translation, public relations and communication services. He has indeed expressed his interest in Indonesia’s growing economy, as he sees the country is producing more wealthy industries. This means there are vast potentials for providing services to assist these individuals in managing their wealth and assets. Due to this, Jean-Pierre has been fully supporting Indonesia’s rising profile in the global economy. Besides his active involvement as a financial expert, Jean-Pierre loves to spend time at the Lavaux vineyards. Beautifully situated above the Geneva Lake, the Lavaux region is known as the place to produce good quality wines since the 15th century.